Iranian parliamentarian says “crucial” for world powers to recognize Tehran’s “enrichment right”; second lawmaker says Iran should not be first to take confidence building measures. Iran views the West’s removal of punitive measures as the sole signifier of progress in talks with world powers on its nuclear issue, Alaeddin Boroujerdi, Chairman of the Iranian Parliament’s National Security and Foreign Policy Commission said Saturday. “(Only) the removal of all sanctions can be a sign of practical step (by the West), otherwise we cannot be hopeful about the results of the talks,” Iran’s semi-official Fars news agency quoted Boroujerdi as saying. Iranian negotiators met with Russia, the United States, China, Britain, France and Germany in Geneva for two days of nuclear talks on Tuesday and Wednesday. The Islamic Republic has reportedly signaled its willingness to curb parts of its nuclear program to secure urgent sanction relief. 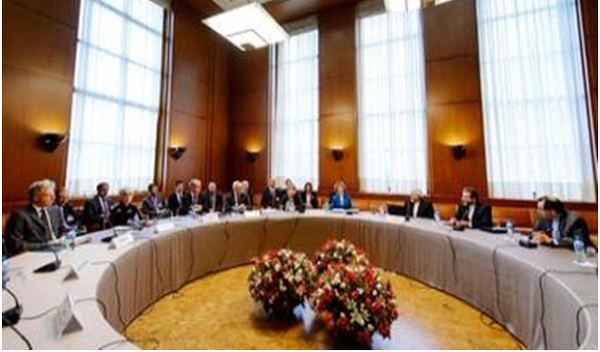 “The crucially important point in the negotiations is the recognition of Iran’s enrichment right,” he stressed. On Wednesday, another Iranian lawmaker reiterated Tehran’s skepticism of world powers and said the West must take confidence building measures before the Islamic Republic ratifies the Additional Protocol to the Non-Proliferation Treaty (NPT). Iranian Parliamentarian Seyed Baqer Hosseini told Fars that Iran should not be first to take such confidence building steps as world powers aim to prevent Tehran from producing nuclear weapons. “Our (nuclear) activities have not faced any problem until now and all of them have been within the framework of the International Atomic Energy Agency and inspected by IAEA inspectors,” Fars quoted Hosseini as saying. On Thursday, The New York Times quoted a senior Obama administration official as saying the US was weighing the possibility of unfreezing billions of dollars of Iranian assets in response to potential concessions by Tehran on its nuclear program discussed at the recently concluded nuclear talks in Geneva. The move would allow Washington to give Iran some economic relief gradually without dismantling the sanctions regime which has been built internationally in the face of the Islamic Republic’s failure to comply with Western demands regarding its controversial nuclear program.